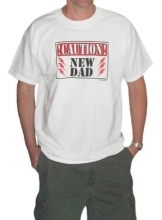 Caution New Dad T-Shirt Discounts Apply ! New dads are wonderful...and fun to watch BUT you have a responsibility to warn others that might wander into his path. This shirt does just that in comfort and style. This shirt is the perfect gift for new fathers to wear home from the hospital.